Maurice claims not to be in the episode. He later realizes that he is in this episode, as The Big Brain. The idea of this episode had been planned from before the show started. The connection to "Roswell that Ends Well" was not part of the original plan. The Professor is not in this episode or the next one, these are the only two episodes without him. Bill Odenkirk was once at a restaurant where the bread had baby roaches crawling out of it, he only noticed after eating some. David's sister once ate in a pancake house where cockroaches had been caught in the dried syrup on a plate of syrup containers. There are lots of revisits to previous episodes in this episode. In earlier versions, the garbage chute only ejected garbage. 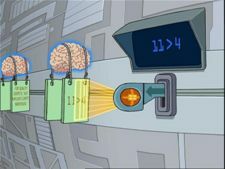 Episodes with higher sci-fi content need a lot more explanation, so they had to have Fry pushed and knocked around to keep the plot moving during explanations. Animators got paid to re animate the content from the pilot, though it was the same footage. Nibbler's shadow was in the pilot as part of the set up for this episode. They had the option to avoid time travel as Nibbler is just very old. There was going to be a long sequence of shots covering the 1000 year period Fry travels through. David X. Cohen: Dripping water is the locker room equivalent of a cricket. Maurice LaMarche: I am in this episode. 'Cause I play the brain. Billy West: Do that voice, the creepy voice. Maurice LaMarche: You mean The Brain? Billy West: Yeah, the creepy voice. Maurice LaMarche: "Pinky, are you pondering what I'm pondering?" Oh, wrong Brain. Maurice LaMarche: You know, for someone who isn't in this episode, I sure am in this episode a lot! David X. Cohen says that the AL2 on the pillars translates to "Yummy tummy". However, it actually translates to "Fuzzy wuzzy." This page was last edited on 28 May 2012, at 20:08.